Where children live, work, play, and learn has a great impact on their lives. Safe communities with ready access to high-quality prenatal and early child care services, schools, and health care facilities, as well as solid job opportunities and low levels of poverty, are positive environments in which to raise healthy children. High-quality early childhood care and education (ECE) services—including home visiting—help overcome barriers and disadvantages for children not fortunate enough to be raised in such environments. But New Mexico’s communities that are the most vulnerable and have the fewest resources for families are not necessarily where most HV programs are located. As budgets are limited, it makes sense to determine where the most vulnerable or at-risk communities are—where the need for ECE services is greatest—to better allocate resources and provide equitable opportunities for children in these areas to thrive. Use of this rating system across states showed that urban areas have the highest levels of child-raising vulnerability, i.e. communities in which there were higher levels of poverty or economic need and lower levels of assets and education. The Western region (including New Mexico) is ranked second in terms of great vulnerability. In the nation as a whole, New Mexico also ranked fifth among the ten states with the highest percent of non-metro tract populations that face barriers to healthy child-raising. For example, San Miguel County has a higher percent of single-parent families (30 percent) than New Mexico (20 percent) does, putting it at a higher risk or vulnerability for raising children on this indicator. 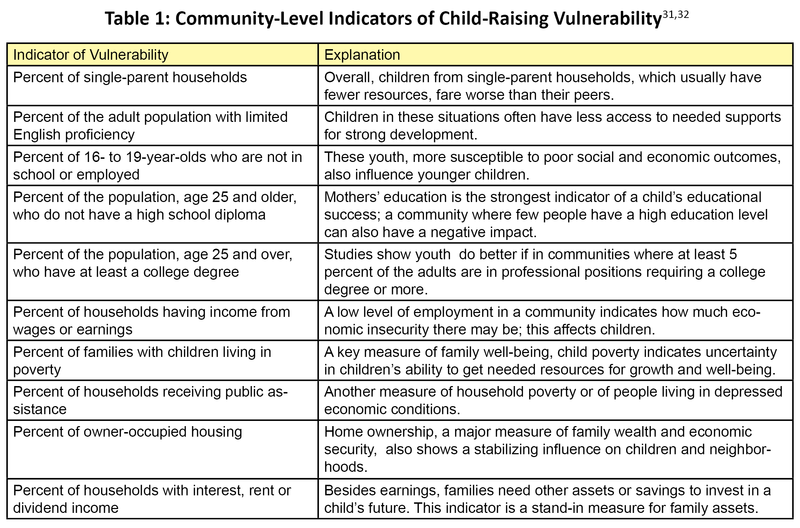 Any county with worse data than the state as a whole on six or more of these indicators is at the highest level of “child raising vulnerability”—in that several educational, economic, and social resources are limited and/or weak. (See Table 3.) Any county, such as Los Alamos, which performs better on these indicators than the state, is considered less vulnerable—one in which the environment is better for raising children well. McKinley County: 35 percent (473 babies) of births were first-borns (2009); 72 percent of these were to single mothers, and the 2010 teen birth rate was 46 per 1000 teens—with 11 percent of families with newborns served by a home visiting program. Nine out of the 12 counties listed as being most vulnerable in child-raising capacity have greater numbers of Hispanics and/or Native Americans than of other races or ethnicities. These include Chaves, Cibola, Guadalupe, Hidalgo, Luna, McKinley, Rio Arriba, San Miguel and Socorro. (See Table 4). “Minority” populations face greater disparities and challenges. 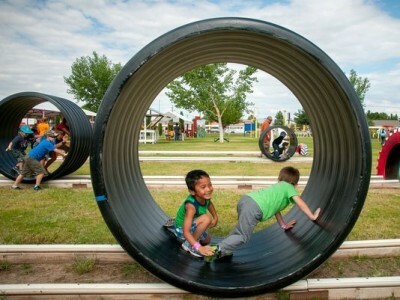 Due to this, they (especially children) often suffer worse economic, health, education and other outcomes, a factor that should be brought into any consideration of priorities in terms of where to add home visiting programs to overcome “place”-related child-raising vulnerabilities in New Mexico. 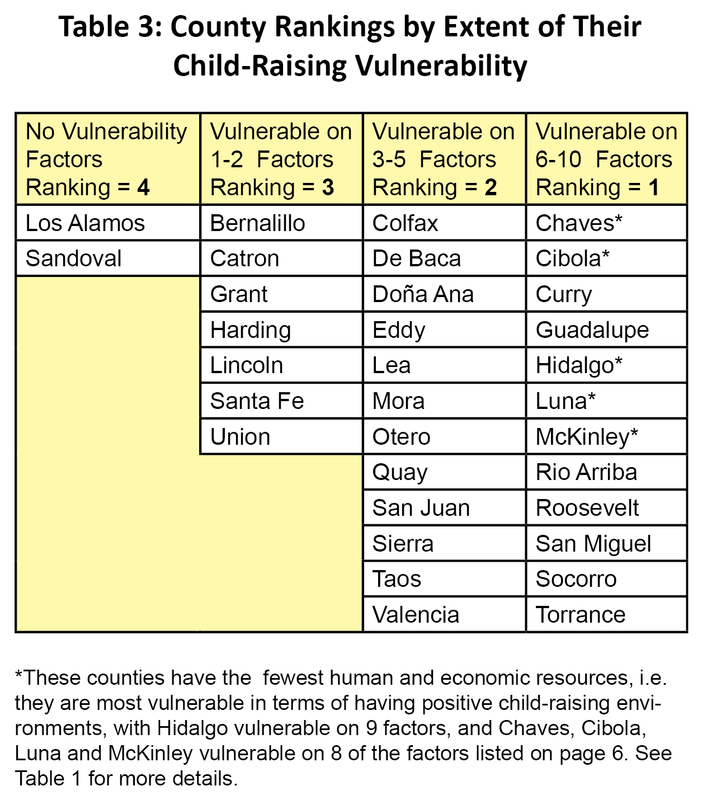 Table 5 shows that in the counties with the most vulnerability/least capacity to best raise healthy children, five (Chaves, Curry, Guadalupe, Luna, McKinley, and Roosevelt) have the capacity to provide home visiting to few families, ranging from zero to 11 percent served. Roosevelt and Guadalupe counties (both with sizeable Hispanic populations) have no home visiting programs at all. McKinley County, in which seven out of every 10 families are Native American, only serves 11 percent of newborns. More extensive, high-quality home visiting programs—as part of a comprehensive ECE system—can contribute greatly to improving education, health, and economic outcomes of New Mexico’s children. These programs do so by helping families—especially low-income, first-time families—deal with many of the barriers to child well-being faced at the earliest stages of a child’s life, especially in areas with fewer resources and support systems. Use cost-benefit, effectiveness, demographic, and cultural data, along with knowledge of relevant funding streams (including Medicaid, public health, early childhood resources and education supports, such as the NM Land Grant Permanent Fund), to decide how to best allocate funding for home visiting and to develop a feasible plan for expansion and improvement in different areas. Take into account the sustainability of funding for these programs as well as the capacity of communities to undertake such programs. Require that most home visiting funds be spent on implementing well-researched programs showing evidence of effectiveness. 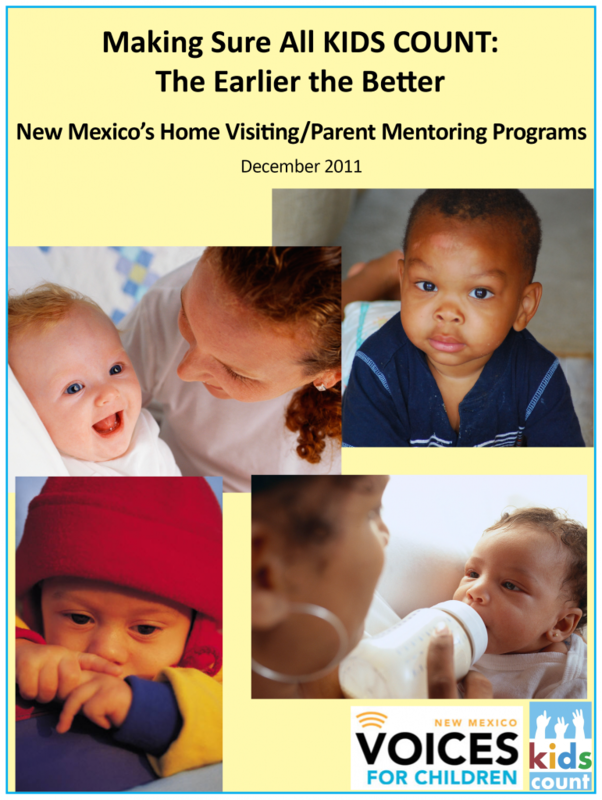 (The results of a rigorous evaluation being done by the Rand Corporation of the First Born® Program, a New Mexico home visiting model designed to meet the specific needs of the state’s families, will be of interest). 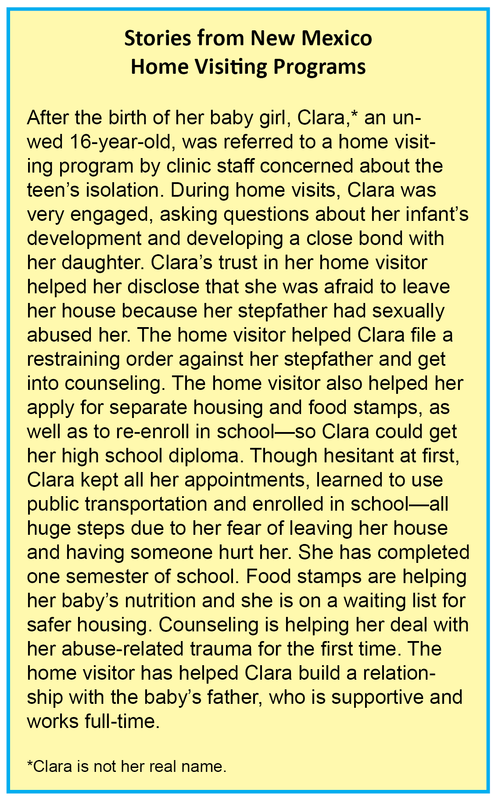 Keep home visiting programs universal in nature, but set clear eligibility guidelines and compliance monitoring to assure more disadvantaged families (usually the least likely to receive services) have access to these programs. 1. New Mexico Children, Youth and Family Department. (2010). 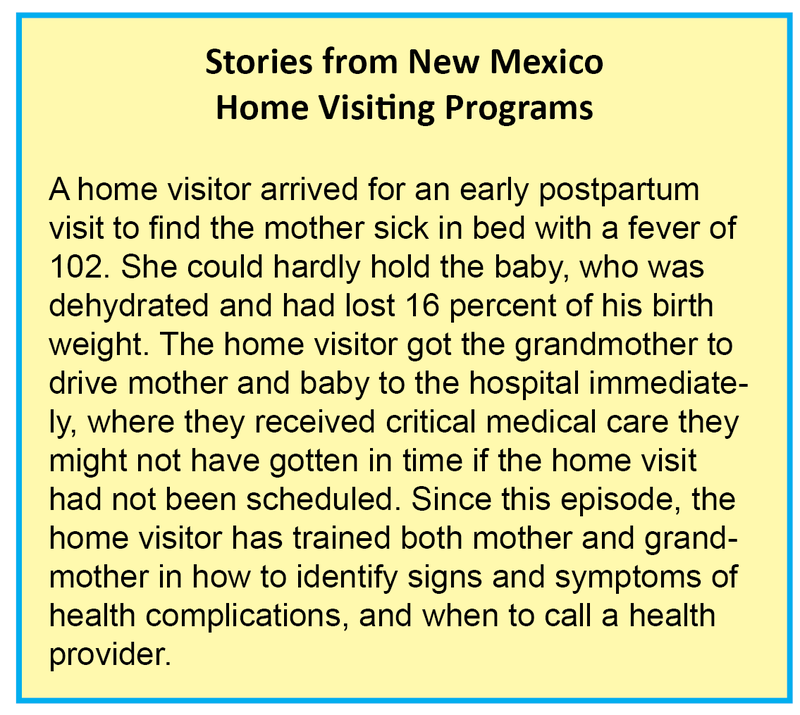 Affordable Care Act Maternal, Infant, and Early Childhood Home Visiting Program: New Mexico’s Statewide Needs Assessment, p. 2. Retrieved July 5, 2011 from http://www.cyfd.org/pdf/NM_HV_Needs_Assessment.pdf. 2. Op. cit., p. 15. 3. Pew Center on the States. (August 2011). States and the New Federal Home Visiting Initiative: An Assessment from the Starting Line. Philadelphia, PA: The Pew Charitable Trusts. 4. Task Force on Community Preventive Services. (October 3, 2003). “First reports evaluating the effectiveness of strategies for preventing violence: early childhood home visitation.” MMWR, 52 (RR14), 1-9. Retrieved July 19, 2011 from http://www.cdc.gov/mmwr/preview/mmwrhtml/rr5214a1.htm. 5. Magnuson, K., Yoshikawa, H. & Brooks-Gunn, J. (June, 2008). What Research Tells Us About Program Effectiveness in the First Five Years. Presentation at the National Symposium on Early Childhood Science and Policy, Harvard University. Retrieved September 1, 2011 from http://developingchild.harvard.edu/index.php/download_file/-/view/109/. 6. Shonkoff, J. (2011). “Protecting brains, not simply stimulating minds.” Science, 333, 982-983. 7. Task Force on Community Preventive Services. (October 3, 2003). “First reports evaluating the effectiveness of strategies for preventing violence: early childhood home visitation.” MMWR, 52 (RR14), 1-9. Retrieved July 19, 2011 from http://www.cdc.gov/mmwr/preview/mmwrhtml/rr5214a1.htm. 8. Center on the Developing Child at Harvard University. (2011). Building the Brain’s “Air Traffic Control” system: how early experiences shape the development of executive function: Working Paper No. 11. Retrieved August 31, 2011 from http://www.developingchild.harvard.edu. 9. Higgins, L., Stagman, S. & Smith, S. (September 2010). Improving Supports for Parents of Young Children: State-level Initiatives. New York, NY: National Center for Children in Poverty. 10. Howard, K. and Brooks-Gunn, J. (2009). 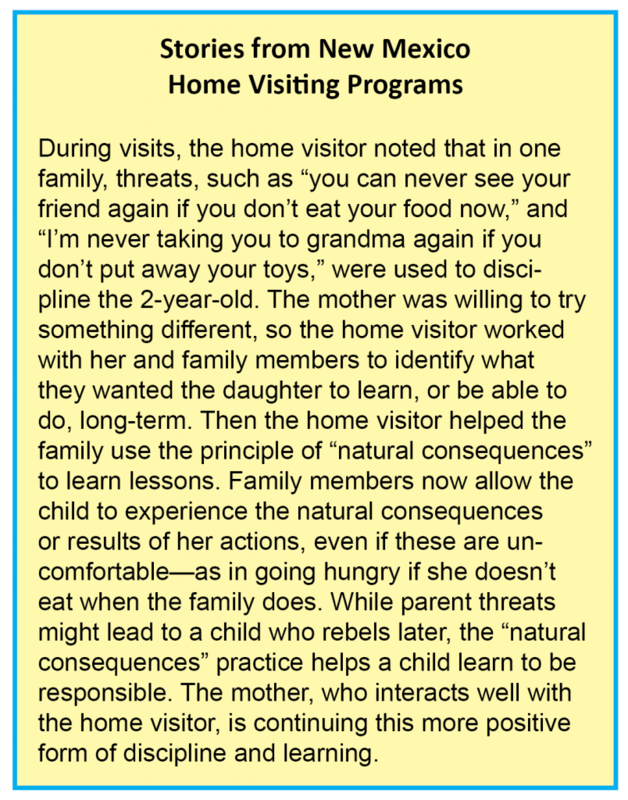 “The role of home-visiting programs in preventing child abuse and neglect.” The Future of Children: Preventing Child Maltreatment, 19 (2), 119-146. 11. Pew Center on the States. (August 2011). States and the New Federal Home Visiting Initiative: An Assessment from the Starting Line. Philadelphia, PA: The Pew Charitable Trusts. 12. Karoly, L., Kilburn, M.R., and Cannon, J. (2005). Early Childhood Interventions: Proven Results, Future Promise. Santa Monica, CA: Rand Corporation. 14. Karoly, L., Kilburn, M.R., and Cannon, J. (2005). Early Childhood Interventions: Proven Results, Future Promise. Santa Monica, CA: Rand Corporation. 16. Eckenrode, J., Campa, M., Luckey, D., Henderson, C., Cole, R., Kitzman, H., Anson, E., Sidora-Arcoleo, K., Powers, J. & Olds, D. (2010). “Long-term effects of prenatal and infancy nurse home visitation on the life course of youths.” Archives of Pediatric Adolescent Medicine, 164 (1), 9-16. 17. Howard, K. and Brooks-Gunn, J. (2009). “The role of home-visiting programs in preventing child abuse and neglect.” The Future of Children: Preventing Child Maltreatment, 19 (2), 119-146. 20. Schuyler Center for Analysis and Advocacy. (Summer 2011). Home Visiting Saves Money, Prevents Child Abuse, Helps Children Learn and Strengthens Families. Albany, NY: SCAA. 21. De la Rosa, I., Perry, J., Dalton, L. & Johnson, V. (2005). “Strengthening families with first-born children: exploratory story of the outcomes of a home visiting intervention.” Research on Social Work Practice, 15 (5), 323-338. 22. National Forum on Early Childhood Program Evaluation. (2008). Evaluation Science Brief: Do Nurse Home-Visiting Programs have Lasting Benefits for Mothers and Children? Retrieved August 12, 2011 from http://www.developingchild.harvard.edu. 23. Anonymous. (2005). Proven Benefits of Early Childhood Interventions. Labor and Population Research Brief. Santa Monica, CA: The Rand Corporation. 24. Mitchell, J. (July 2011). 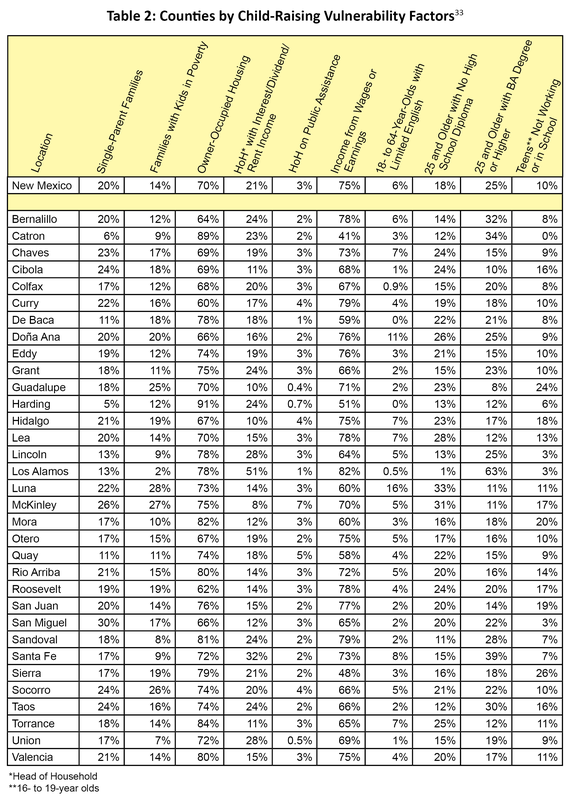 Central New Mexico Education Needs Assessment. Albuquerque, NM: United Way of Central New Mexico. 25. Karoly, L., Kilburn, M.R., and Cannon, J. (2005). Early Childhood Interventions: Proven Results, Future Promise. Santa Monica, CA: Rand Corporation. 26. Magnuson, K., Yoshikawa, H. & Brooks-Gunn, J. (June, 2008). What Research Tells Us About Program Effectiveness in the First Five Years. Presentation at the National Symposium on Early Childhood Science and Policy, Harvard University. Retrieved September 1, 2011 from http://developingchild.harvard.edu/index.php/download_file/-/view/109/. 27. New Mexico Legislative Hearing Brief. Early Childhood Services (CYFD, DOH, PED). Code 690,665,924. August 17, 2011. 28. Bruner, C., Stover Wright, M., Tirmizi, S.N. and the School Readiness, Culture, and Language Working Group of the Annie E. Casey Foundation. (January 2007). Village Building and School Readiness: Closing Opportunity Gaps in a Diverse Society. A Resource Brief of the State Early Childhood Policy Technical Assistance Network. Des Moines, IA: Child and Family Policy Center. 29. Magnuson, K., Yoshikawa, H. & Brooks-Gunn, J. (June, 2008). What Research Tells Us About Program Effectiveness in the First Five Years. Presentation at the National Symposium on Early Childhood Science and Policy, Harvard University. Retrieved September 1, 2011 from http://developingchild.harvard.edu/index.php/download_file/-/view/109/. 30. Pew Center on the States. (August 2011). States and the New Federal Home Visiting Initiative: An Assessment from the Starting Line. Philadelphia, PA: The Pew Charitable Trusts. 31. Bruner, C., Stover Wright, M., Tirmizi, S.N. and the School Readiness, Culture, and Language Working Group of the Annie E. Casey Foundation. (January 2007). Village Building and School Readiness: Closing Opportunity Gaps in a Diverse Society. A Resource Brief of the State Early Childhood Policy Technical Assistance Network. Des Moines, IA: Child and Family Policy Center. 32. Bruner, C. (August 2010). Learning to Read: Developing 0-8 Information Systems to Improve Third Grade Reading Proficiency. Des Moines, IA: Child and Family Policy Center. 33. Data for Table 2 come from the U.S. Census, American Community Survey, 2005-2009. Tables (in order of columns, left to right): B11004, B17010, B11012, B19054, B19057, B19052, B16004, B15002, B15002, and B14005. 34. Data for Table 4 come from the U.S. Census, American Community Survey, 2009. 35. 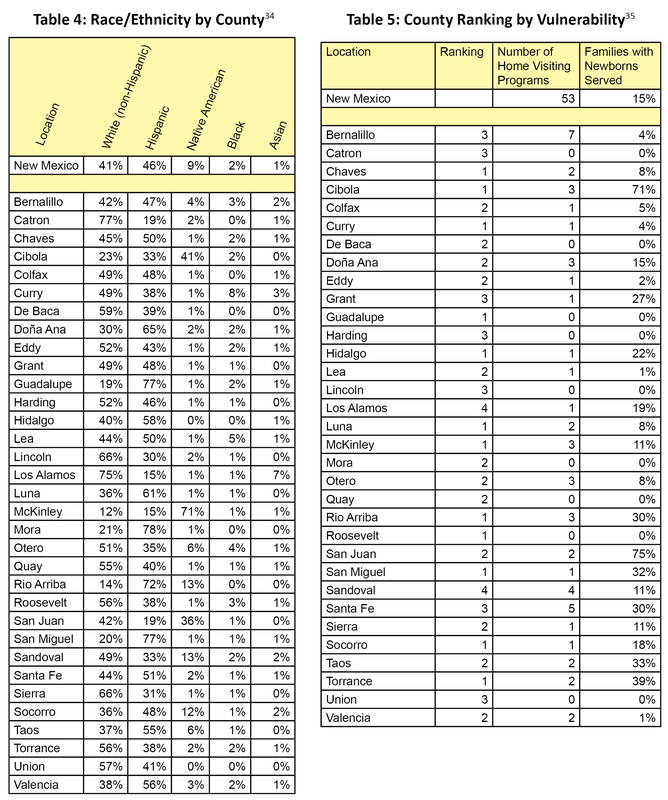 Data for columns 2 (Number of Home Visiting Programs) and 3 (Families with Newborns Served) come from the 2010 New Mexico Home Visiting Statewide Needs Assessment report and supporting data tables from the NM Department of Health. 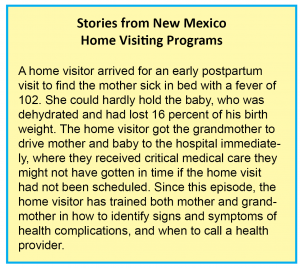 New Mexico KIDS COUNT wishes to thank a variety of home visiting programs around the state for providing stories and examples of how effective home visiting can be for their clients. We have tried to ensure anonymity through the use of false names and by leaving out geographic or other potentially identifying information. We appreciate their assistance with this report.